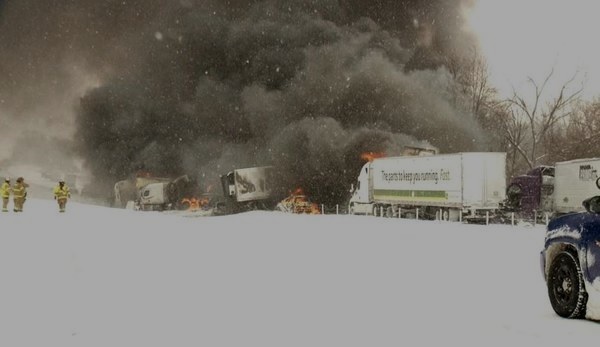 On January 9, 2015, a crash near mile-marker 90 on I-94 west of Battle Creek caused a pileup of 193 vehicles, including 76 tractor-trailers. One truck driver was killed and 22 people were hospitalized. Many vehicles and freight were destroyed. The road was closed for two days during the cleanup. A month later, the Michigan Department of Transportation (MDOT) commissioned a Road Safety Audit on that stretch of road. The results of that study were issued on Monday. Approximately 65 percent of the winter season crashes involved a vehicle driving “too fast for conditions”, compared to only 38 percent of all-season crashes. This suggests that speed plays a greater role in winter-season crashes compared to other seasons. This also supports the Michigan State Police (MSP) findings from the January 9, 2015 crash, in which a total of 58 drivers were cited for driving too fast for conditions, including 30 commercial drivers. “With 77 percent of drivers driving too fast in the snow, causing the crashes, we certainly need to have education also,” Capt. Michael Brown, MSP, said. State Police intend to increase patrols during adverse weather. Other countermeasures will include an additional lane, better signage and use of smart technology. § 392.14 Hazardous conditions; extreme caution. Extreme caution in the operation of a commercial motor vehicle shall be exercised when hazardous conditions, such as those caused by snow, ice, sleet, fog, mist, rain, dust, or smoke, adversely affect visibility or traction. Speed shall be reduced when such conditions exist. If conditions become sufficiently dangerous, the operation of the commercial motor vehicle shall be discontinued and shall not be resumed until the commercial motor vehicle can be safely operated. Whenever compliance with the foregoing provisions of this rule increases hazard to passengers, the commercial motor vehicle may be operated to the nearest point at which the safety of passengers is assured. This regulation is what is known as a standard of care, or the duty of care which all people have toward others. This regulation defines how a reasonably careful person should have and would have acted in a situation of hazardous driving conditions. This video captures, from inside a truck, what went down during the January 9th crash. There is precipitation on the windshield and the road is snow covered. While the driver was able to stop, another truck locks it’s brakes and crashes into the pile. Minutes later, flames start to spread over the wrecked vehicles. Then the calls started to come in to 911 . . . The biggest lesson here is that drivers were not following the standard of care required of them. Drivers were simply traveling too fast for conditions. The pileup started when a van slowed down because of the condition of the road and was rear-ended by a tractor-trailer. Soon dozens of tractor-trailers piled up, including one hauling hazardous materials and one hauling fireworks, that later exploded in the fire that followed. 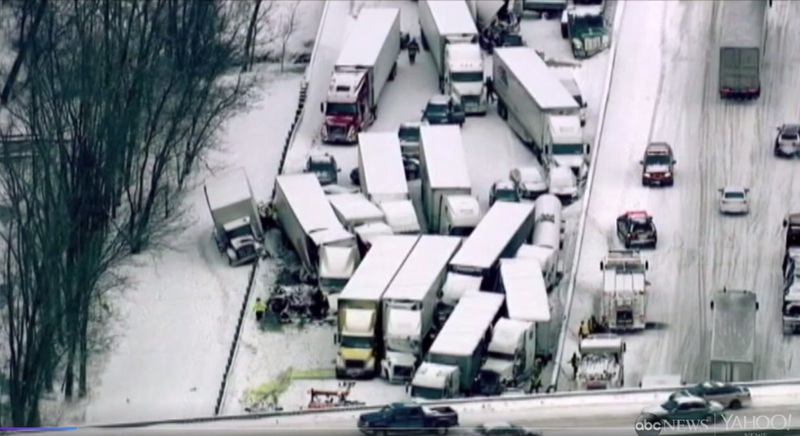 Almost half of the truck drivers in this pileup were cited for speeding. • Distribute the weight of the load as evenly as possible. Scale every load in winter: invest in safety. • Slow down gradually. Avoid panic stops. Avoid use of the brakes. One winter driving tip is to de-clutch the power train by feathering the clutch pedal and simply idling to a slower speed or stop. This technique works on black ice as well, when hitting the brakes can cause a spin or jack-knife. • Accelerate slowly. Spinning the tires means there is no traction and no action. • The worse it becomes, the slower you need to drive. Put on the emergency lights, if necessary, to “be seen” and to warn other drivers of your presence. Keep a six-second following distance and keep a “space cushion” around the vehicle. Don’t stay in a “pack” of vehicles. • Do not use cruise control in adverse weather. Stay in control. • If conditions are dangerous, do not continue to drive, per §392.14. Hills, slopes, blind curves or grades may be particularly hazardous. The key thing to keep in mind is the possibility of loss of control. If the wheels start to spin or the front tires start to slip or slide, the vehicle cannot be controlled. The vehicle must be kept under control at all times. That is what we mean by following a standard of care. • Do not pay attention to what other drivers are doing. Their equipment and loads may be different. Always drive at a safe and prudent speed that works for you. In adverse weather, slower is faster. The key is smooth driving. Winter is a time we all need to re-learn how to drive again. This entry was posted in Defensive Driving, DOT 101 and tagged Driving in Hazardous Conditions, standard of care for hazardous driving, Tips to Avoid Winter Crashes by admin. Bookmark the permalink.